So how does our 14 cuft. stack up against the competition? Good question. We’ve been around for over 8 years now, starting with the SunStar units. It’s been a while, and it’s been revised for the better over time. Space hasn’t shrunk, but potentially getting bigger as we look for new more effective materials. It’s the progressive evolution of a product. We were the first with the SunStar 14 cuft. because we have one of most efficient compressor available and we’re always striving to make it better. So… what do I have to back this information? Read on! Let’s take at our other major competitor in the solar chest freezers. 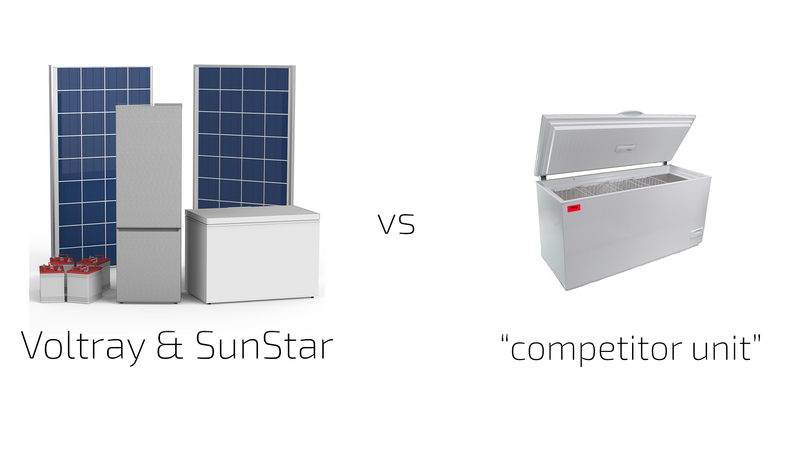 We’ll take a look at our competitor’s unit stacks against our SunStar Unit. The largest size of chest freezer was introduced as a 14.7 cuft. Sporting a 390L Capacity. This actually translates into about 13.8 cuft. which isn’t quite 14.7. It has been since revised to 13cuft. changing the capacity to a 368L unit. This revision was done quietly and the model is still referred to as a 390. This leads minor change still have vendors refer to this particular unit as a 14 cuft. chest freezer when in fact, it’s 13! If you go to their website, the model states that the capacity is at 368L, the model number implies the older 390L, and the description for the product says the capacity is 378L (This was likely a typo that got missed, but still). So… yes? In terms of consumption, here’s another funny little detail I’ve noticed. The competitor’s 13cuft. consumes about 800W in 24hours. This sounds pretty good, almost as efficient as ours and nearly gives us a run for our money. However, the devil’s in the details. Upon looking at the spec sheets, the state that this number was achieved with the freezer set to run at -12°C at 32°C ambient temperature (which is pretty toasty). However, as we noticed in the previous post, the safe temperature as outlined by the FDA is -18°C. So… they’re testing this warmer than what the FDA recommends for safe freezer storage. What we’ve also noticed is that some of our competitors, can’t actually go down to safe freezer temperatures of -18°C. Our SunStar units can go down to a chilling -22°C. What does that mean? If you get a SunStar or Voltray appliance, you’re creating a smaller footprint. It’s a smaller setup for the same amount of work. It’s money back into your pocket that increases in value for what you need to do. There’s something special about the longevity of a product on market. We’re highlighting our parameters and consumption data because we stand behind our products. Under the same ambient testing temperature of 32°C, our chest freezer only consumes 708W in a 24hr period. However, the difference is that our results are from our freezer being set to -18°C. If it were a fair comparison to many of our competitors, we would use our numbers from testing at -13°C. So In our second data set, our consumption is only 522W in 24hr. That’s almost a 300W difference, a nearly 25% increase in efficiency under the same testing criteria. Hi: We have been searching for reliable solar refrigerators to list on our website greenkitchens.com. It was good to read your analysis as it shows C4PInc cares about quality and has integrity. I also just read the two great customer reviews on the product page for your 11.1 cu ft model and and was also glad to find out that these fridges have been around for years. We are currently an Amazon affiliate and hope some of your customers will write and post a review for your product there: https://www.amazon.com/VoltRay-11-1-Cu-Solar-Refrigerator/dp/B017MTECX2/ref=pd_sbs_265_6?_encoding=UTF8&pd_rd_i=B017MTECX2&pd_rd_r=ZKJETYFA184FCTW5RVWG&pd_rd_w=Hpzai&pd_rd_wg=XNHIq&psc=1&refRID=ZKJETYFA184FCTW5RVWG. It is a difficult decision for us to list a product that has no reviews.